“I wish sometimes that I had died in Iraq. So that my life would have meant something.” Robert Rissman is a 22-year old Iraq combat veteran who returned from Iraq with undiagnosed PTSD. As Robert struggled to cope with his disability, he became one of 8,000 homeless veterans living on the streets of Los Angeles. Robert’s story was told on a CNN featured segment last night. It also describes the lawsuit we filed in June against the Department of Veterans Affairs for its failure to ensure that struggling veterans like Robert have meaningful access to the mental health, medical, and other services they deserve. Our society has a responsibility to take care of vets like Robert after they finish their service to our country, and we rely on the VA to make good on that commitment. The VA is supposed to support veterans and prevent veteran homelessness. 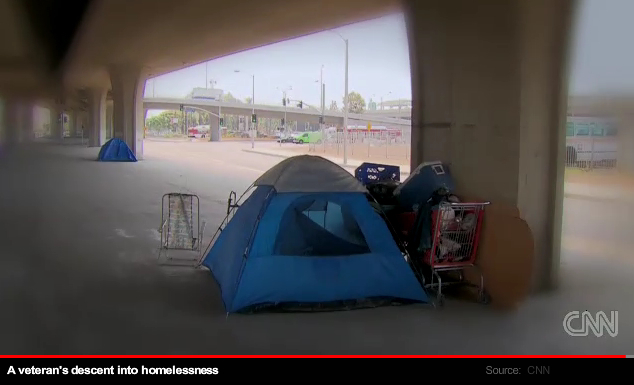 It’s also supposed address the underlying conditions that lead to veteran homelessness, and provide stable housing and care while veterans get back on their feet. The VA’s failure to provide housing and care that even its own experts recognize is necessary for homeless veterans with serious mental disabilities is even more scandalous in LA because the VA is also mismanaging a 387-campus that was given the federal government for the express purpose of providing a home to disabled veterans. Instead of housing veterans, the VA has housed rental cars, commercial bus storage lots, and a luxury hotel laundry facility. Spread the word about this story, about the case, about this issue, and about the VA's mismanagement of the West Los Angeles VA campus. Call your local congressperson, Senator Feinstein, or the veterans affairs committees in Congress, and demand that they hold congressional hearings to get to the bottom of this scandal. On average, 18 veterans kill themselves each day, so the VA's delay tactics here are costing lives.